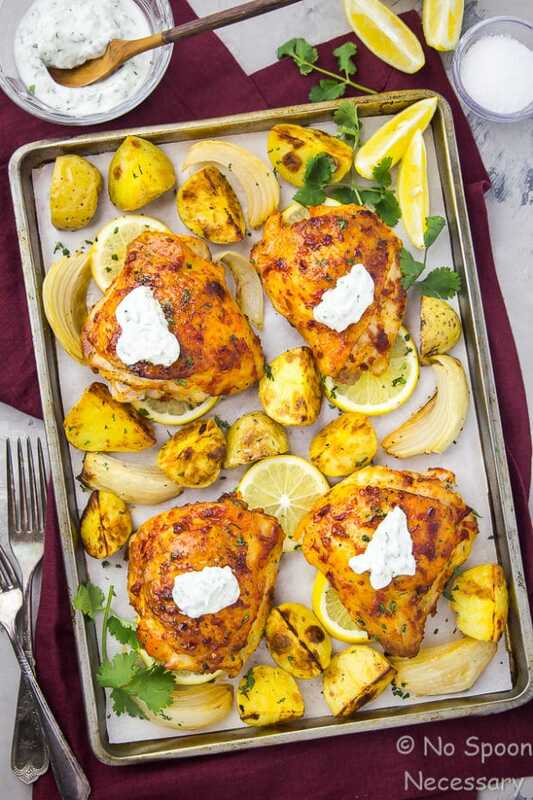 This Sheet Pan Harissa Chicken with Potatoes and Onions is jam packed with bold, savory, smoky, spicy flavors and perfectly balanced with a dollop of lemony yogurt! 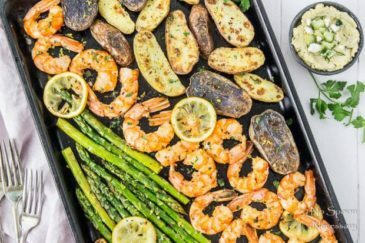 Effortless and easy, yet downright delicious, this complete sheet pan meal is the answer to your weeknight dinner woes! Hiiii-ya friends! Happy almost weekend! AND happy second day of March! ⬆️️ I know, say whaaaa? Seriously. WHERE does time go? I feel like it was just Christmas .2435 seconds ago. Right? Or, is my concept of time completely out of wack? Don’t get me wrong though, I’m SO NOT complaining that it is March 2nd, because that means we are exactly EIGHTEEN days away from spring! Plus, 18 just so happens to be my favorite number. So, I’m nothing but jazz hands, dance party in the USA, type of happy over here. But, maybe don’t bring on the pollen? My sinuses aren’t the biggest fan. Aka cluckin’ delicious spicy chicken and ‘taters. Crispy skinned, juicy, tender, succulent chicken thighs smothered and covered in a smoky, savory, sweet and spicy harissa-honey sauce; paired with crispy roasted potatoes and flavorful, golden onions. Finished with a sprinkling of fresh, herbaceous cilantro and a generous dollop of cool, tangy yogurt. This dish is like WHOA for your taste buds. For those of you who are not familiar with harissa, you need to stop what you are doing and come on ride this tasty train. *Scroll down for more information on harissa! Harissa is simply a spicy, aromatic hot chili pepper paste and a traditional accompaniment with Moroccan and North African food. The hot chili pepper paste is as popular a condiment in Morocco and North Africa as ketchup and mustard are here in the states. The condiment is quite versatile and can be served with everything from eggs and burgers to couscous and soups! What is Harissa made of? Harissa is made up of roasted red peppers, Baklouti pepper, serrano peppers, and other hot chili peppers, spices and herbs. It’s downright delicious and can be found in the ethnic isle of most grocery stores. First you need to make the harissa honey sauce by combining some harissa and honey (duh) with a bit of garlic, a splash of lemon, a touch of cumin, a drizzle of oil and a generous sprinkle of salt and pepper. Whisk it real good and then set aside. 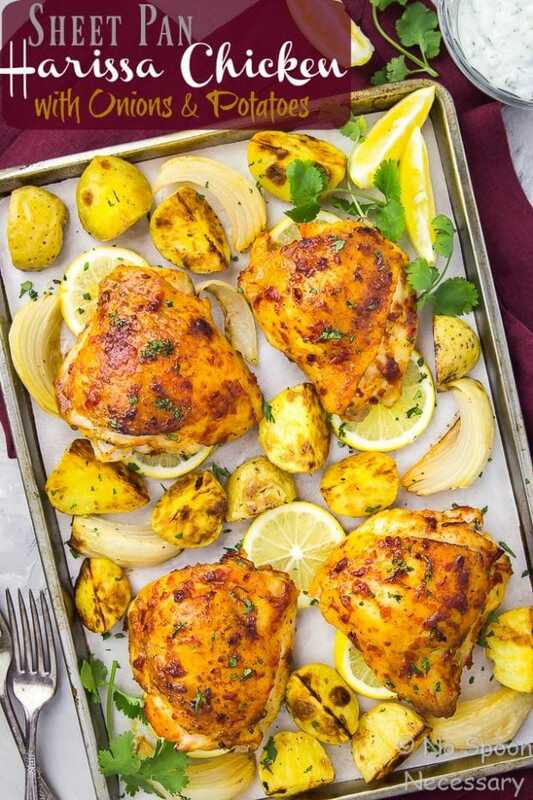 Line a baking sheet with non-stick aluminum foil for easy clean up, and then place a bunch of lemon slices around the middle of the pan (this will be like a ‘bed’ for your chicken). Place the chicken thighs, SKIN SIDE UP, on top of the lemon slices and then brush the harissa mixture liberally on top. Arrange the potatoes and onions around the chicken. Drizzle them with a bit of oil and season with salt and pepper. Transfer the sheet pan into the oven and roast everything for 40 minutes, or until the chicken is cooked through and the taters are golden brown. While everything is roasting, quickly whip together the yogurt dip. Don’t worry, this step is SUPER easy. Simply combine some yogurt with a bit of lemon juice, a minced clove of garlic and cilantro. Stir and season to taste. BOOM. Yogurt done. To serve, top the chicken with a generous dollop of yogurt and sprinkle with some chopped cilantro. Finish it off with some extra wedges of lemon on the side. 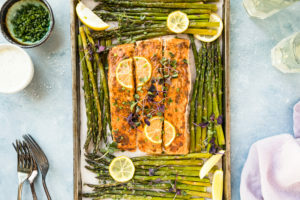 Easy-peasy sheet pan meal to your hectic work week rescue! I used bone-in, skin on chicken thighs for this meal, but you can substitute chicken breast or bone-less, skinless chicken thighs. You will just need to adjust the cooking time down, because your chicken won’t take as long to cook. 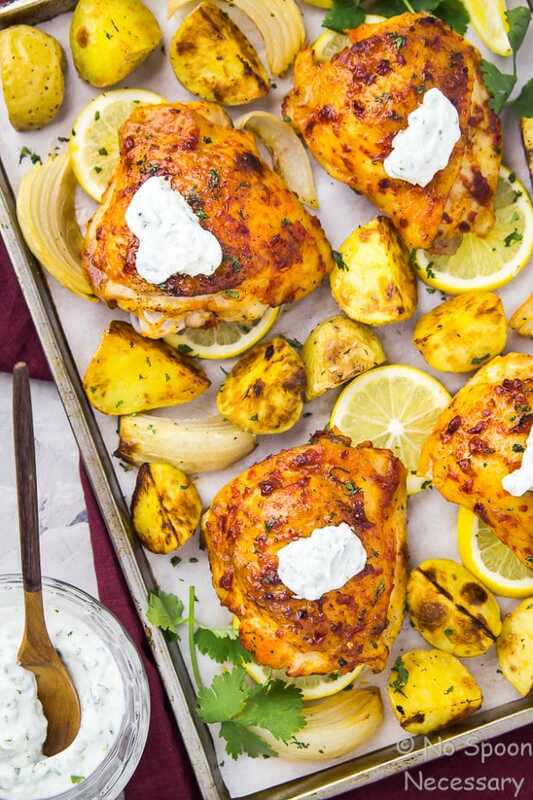 I recommend if you do substitute the type of chicken, you start the potatoes in the oven and then add the chicken to the baking sheet after 10 minutes or so. If you adjust the cooking time down, but don’t pre-roast the potatoes for a few minutes, they won’t turn out golden brown, crispy and delicious. You can make your own harissa or use store bought. I like either Mina Harissa (spicy) or Mediterranean Gourmet Moroccan Harissa (100% natural with pickled lemon). You can find harissa in the ethnic isle of most grocery stores. 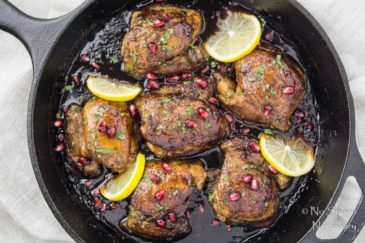 If you want chicken with a TON of flavor, you can marinate the chicken thighs in the harissa-honey mixture for a few hours, or up to overnight, instead of just brushing it on the chicken. The recipe below calls for Fage Greek yogurt, which is just Greek yogurt that has been strained. You can substitute regular Greek yogurt and strain it yourself. Simply place the Greek yogurt in a cheesecloth and suspend it over a bowl. Place it in the refrigerator for AL LEAST 30 minutes to strain. If you aren’t a fan of cilantro, you can absolutely substitute fresh parsley. 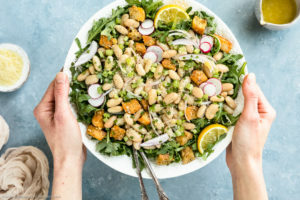 If you are looking to add a little more greens to your meal, this chicken pairs really nicely with peppery arugula! 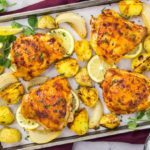 Effortless and easy, yet downright delicious, this Sheet Pan Harissa Chicken with Potatoes is the answer to your weeknight dinner woes! Until next week friends, cheers – to spicy sustenance. Preheat oven to 400 degrees F. Line a large, rimmed baking sheet with non-stick aluminum foil. 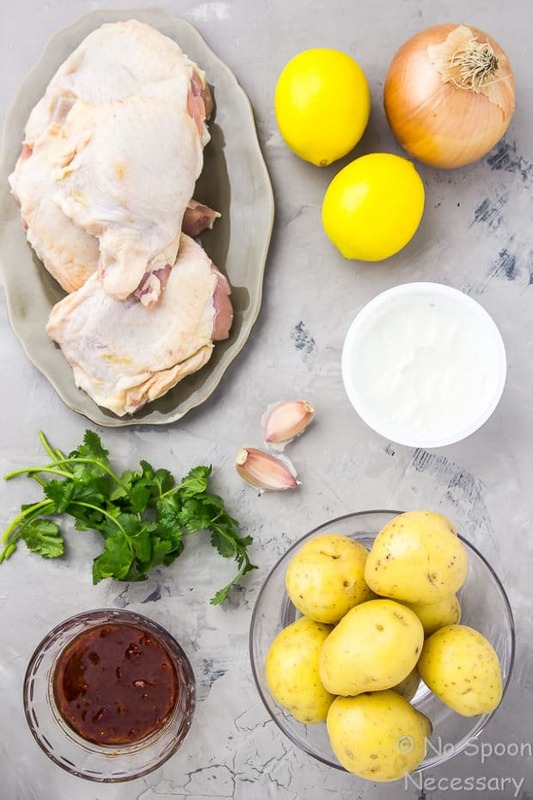 For the marinade*: In a small bowl combine, 1 tablespoon of the lemon juice, harissa, 1 clove of minced garlic, honey, oil, cumin, sea salt and pepper. Mix to combine. Place the lemon slices in the middle of the prepared baking sheet. Place the chicken, skin-side up, on top of the lemon slices. 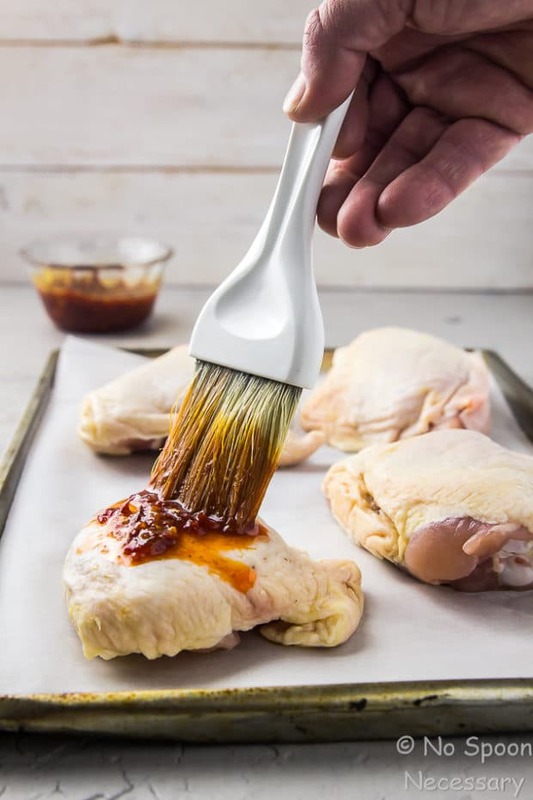 Rub the chicken all over with the harissa marinade *. Arrange the potatoes and onions around the chicken on the baking sheet and drizzle with olive oil. Season generously with salt and pepper. Roast for 35-45 minutes, or until the chicken is cooked through (165 degrees F) and everything is golden brown and crisp. Meanwhile, make the yogurt dip: In a small bowl combine the yogurt with the remaining lemon juice, garlic and cilantro. Season to taste with salt and pepper. 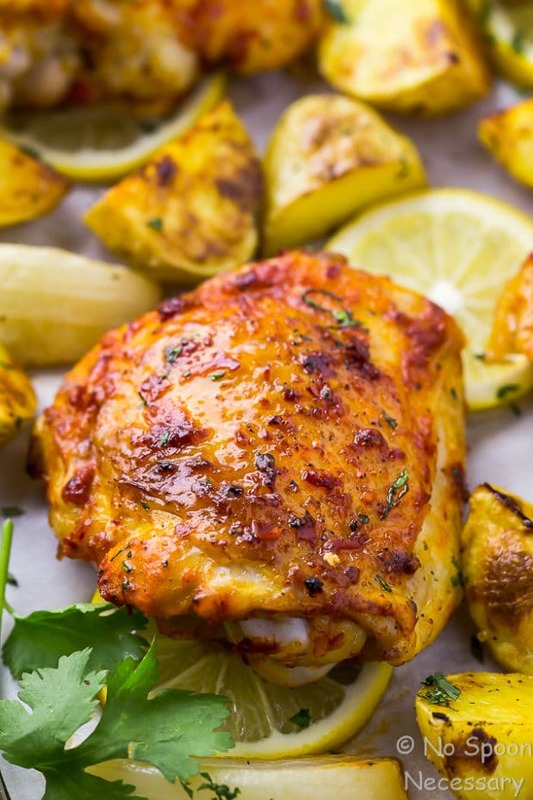 Serve the chicken and potatoes with yogurt dip, arugula, cilantro and lemon wedges. Enjoy! 1. I used bone-in, skin on chicken thighs for this meal, but you can substitute chicken breast or bone-less, skinless chicken thighs. You will just need to adjust the cooking time down, because your chicken won’t take as long to cook. I recommend if you do substitute the type of chicken, you start the potatoes in the oven and then add the chicken to the baking sheet after 10 minutes or so. If you adjust the cooking time down, but don’t pre-roast the potatoes for a few minutes, they won’t turn out golden brown, crispy and delicious. 2. You can make your own harissa or use store bought. I like either Mina Harissa (spicy) or Mediterranean Gourmet Moroccan Harissa (100% natural with pickled lemon). You can find harissa in the ethnic isle of most grocery stores. 3. 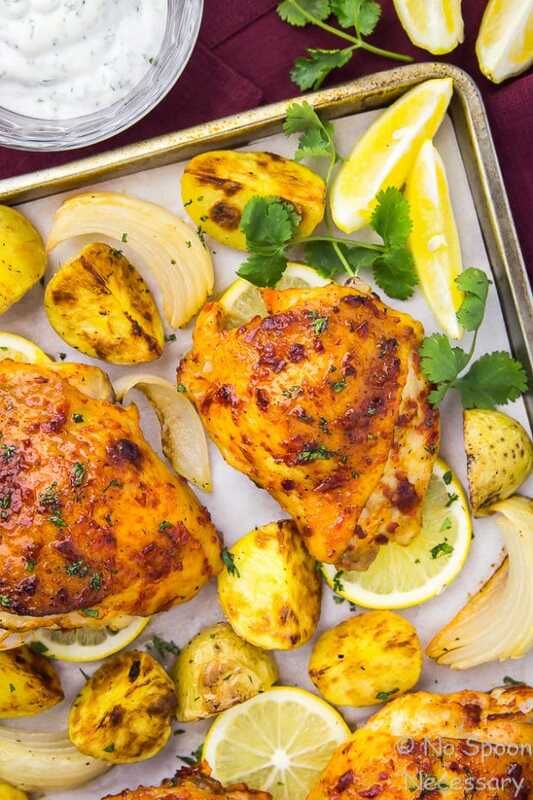 If you want chicken with a TON of flavor, you can marinate the chicken thighs in the harissa-honey mixture for a few hours, or up to overnight, instead of just brushing it on the chicken. 4. The recipe calls for Fage Greek yogurt, which is just Greek yogurt that has been strained. You can substitute regular Greek yogurt and strain it yourself. Simply place the Greek yogurt in a cheesecloth and suspend it over a bowl. 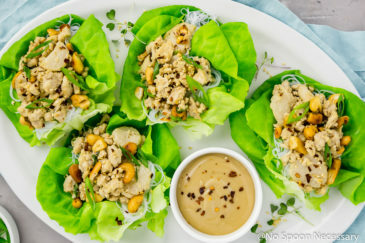 Place it in the refrigerator for AL LEAST 30 minutes to strain. 5. If you aren’t a fan of cilantro, you can absolutely substitute fresh parsley. 6. 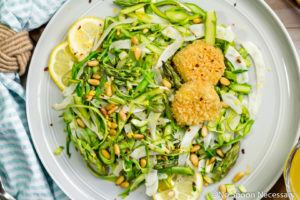 If you are looking to add a little more greens to your meal, this chicken pairs really nicely with peppery arugula! *Recipe inspired by NYT Cooking. I love harissa! 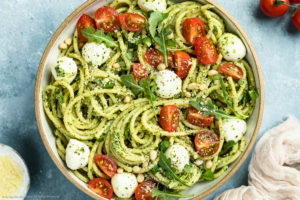 Thank you so much for sharing this recipe, it looks like one my family would love. Can’t wait to make it at home! 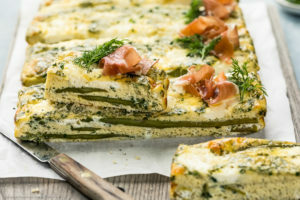 This looks great and perfect for serving a large crowd. We are big fans of your blog and your posts. We are big fans of harissa in this house! And slathered onto chicken and tossed into the oven with onions and potatoes? 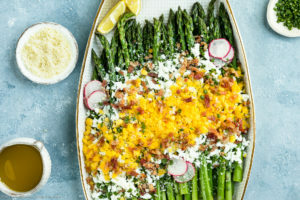 Spells easy and delicious weeknight dinner to me! I love spring too and today we had our first spring day this year. It might still snow again next week, but today was just perfect. Very much like your recipe, chicken thighs could not look any better. I am counting down the days with you! It’s not that I mind winter….but I am so looking forward to it being over this year! It’s been a long one. This meal looks great. I’ve never tried harissa but it sounds fabulous! 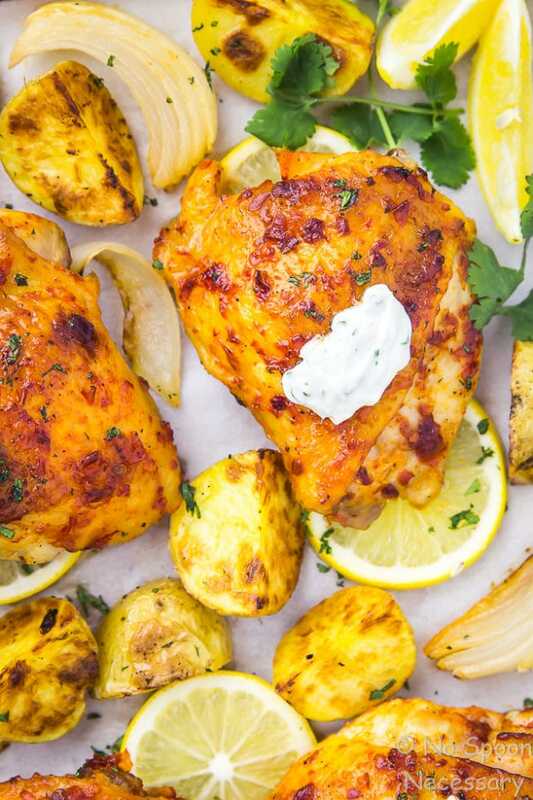 I have a jar of homemade harissa in the fridge and this sounds like a perfect way to use some of it…you chicken looks yummy. 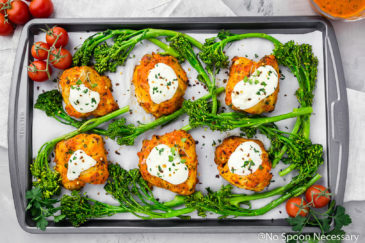 This is such a gorgeous and CREATIVE sheet pan meal! I love how you come up with these awesome combinations no one else does. Brilliant! I am so ready for warmer weather, too. We are slowly getting there! Nope, no Oscars here, Dave is not a big fan of awards shows and frankly we haven’t seen many movies this year so it was no biggie. This is a beauty and I love the yogurt add to top it off and cool things down. Isn’t harissa wonderful? I make my own with a little orange peel added and it’s fantastic on grilled lamb, too. Beautiful photos Chey! Have a great weekend. I’m excited for spring every year, except for the hay fever that comes with it! From a food standpoint, it just doesn’t get much better. And I’m in love with this chicken! The harissa gives it such a great color and it must taste even more amazing. 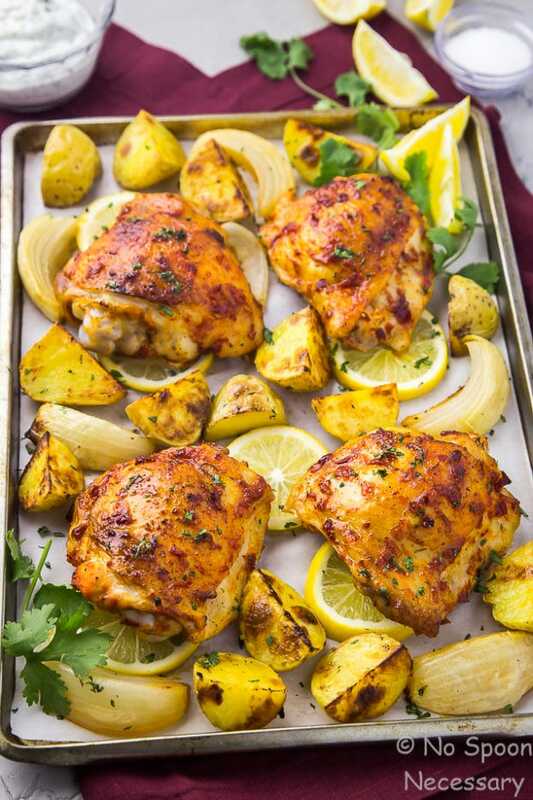 That fresh lemon and potatoes and onions make this one killer sheet pan dinner! 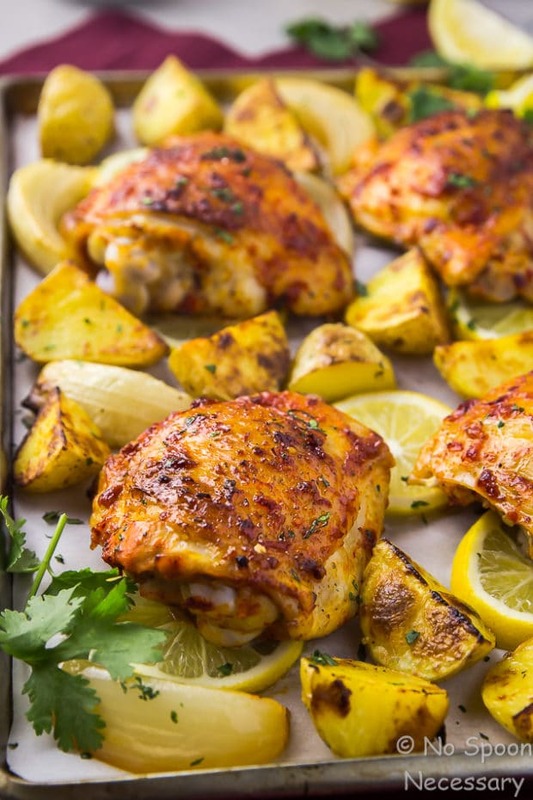 Sheet pan suppers are The Best, and yours (as usual) is SO creative and gorgeous. YAY SPRING!